What Oil Is Suitable For Air Fryer? By now, we’ve all heard time and time again that air fryers require less oil. It’s part of what makes them “the healthy cooker.” But one question remains. What oil should you use in an air fryer? Remember, less oil does not mean no oil. So, with this in mind, you’ll need some form of fat to get your favourite tasty meals frying. Sadly, one problem exists here. You’ll find countless oils on the market shelves. And each of these oils serves an entirely different purpose. But we’re here to clear all that up. So today, let’s take a look at the most suitable oils for your air fryer. 2 What Are The Best Oils For An Air Fryer? First things first. What’s the most important part of oil selection? Surely, you’ll want to start by looking at the calories, right? Low calories are nice and all. But you’ll want to start by looking at a fat’s smoke point. So that leads to the next question: What is a smoke point? In scientific terms, this is the temperature where your oils become fatty acids. Visually, this is the heat where your oils begin producing smoke. Hence the name smoke points. But here’s why this really matters. Air fryers are notoriously terrible at ventilating smoke. So best case scenario, you’re stuck with a horrendous smoke odour in your home. Worst-case scenario, your house burns down. Either way you look at it, excess smoke in your air fryer is not good. So, as a rule of thumb, oils with smoke points of 204°C are most optimal for your air fryer. Unfortunately, you’ll rarely find smoke points on the labels of your oils. Thankfully, Wikipedia dedicated an entire page to smoke points. So if you need a quick reference, be sure to check out the page’s table for the most common fats. What Are The Best Oils For An Air Fryer? Avocado oil is downright amazing for frying your favourite foods. First off, this fat packs massive amounts of omega 3s. Some studies even indicate that avocado oil can regulate cholesterol levels and accelerate healing. If that’s not healthy, we’re not sure what is. Lastly, this oil lacks any strong flavour, which means it cooks great with just about anything. Here’s another type of oil that is high in omega 3s. But what separates most nut oils from avocado oils is their distinct tastes. Each type of nutty oil produces extremely unique flavours. So, don’t be afraid to experiment to see which enhance the taste of your favourite foods the most. Here’s an option that’s great for speciality diets. As a whole, ghee works pretty similarly as butter. The big difference here is that this fat offers a much higher smoke point and no dairy. In other words, ghee is completely lactose free. So you won’t get an upset stomach after eating your favourite fried foods. And as an added bonus, ghee packs a high amount of vitamin A, vitamin E, and vitamin K. So if you’re looking to improve your skin and gut health, you can’t go wrong with ghee. 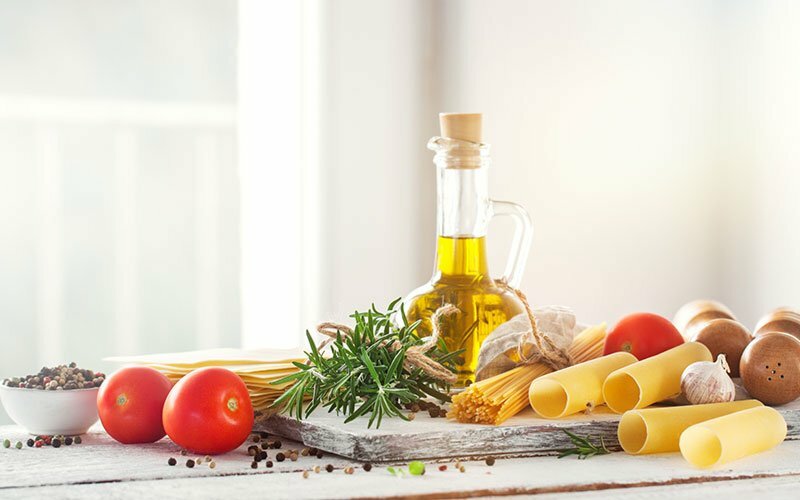 Olive oil is a fantastic addition to any meal. Not only does this oil please your taste buds, but it also offers a great source of oleic acid. This monosaturated fat is great for accelerating healing. Combine this with a huge amount of antioxidants, and light olive oil can easily become a staple to any air fryer meal. As everything currently stands, air fryers are a great way to make your favourite foods healthy. So why not make them healthier by selecting the right fats and oils? At the end of the day, each oil performs a different task inside an air fryer. Therefore, you can’t go wrong with playing around with the different flavours to innovate your favourite foods. Just remember to check those smoke points to ensure you air fry your meals safely. Do electronic water softeners really work? Is It Safe To Drink Water From A Water Softener?